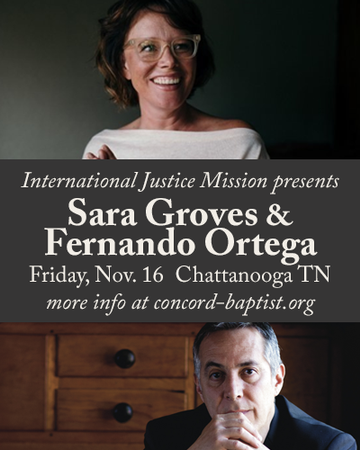 Concord welcomes Sara Groves and Fernando Ortega to Chattanooga. Tickets are only available online. Doors will open at 6:30 pm. Sara Groves is singer/songwriter and recording artist with a passion for justice and a heart of mercy. Her songs capture rich, meaningful interactions with the truth of scriptures as they are reflected on and lived out between us. Sara has been nominated for 7 Dove Awards and has produced a string of successful albums including her latest, Abide With Me, a collection of hymns recorded in a 110-year-old church. Fernando is known for breathing life into the hymns of the church and finding new expressions of worship through his songwriting through 18 recording projects. He has 3 Dove Awards and a Billboard Latin Music Award to his credit. His latest project is a collection of songs and readings centered on The Crucifixion of Christ. According to his website, he is also "an all around great guy." The opportunity to bring these artist together was made possible through their support of International Justice Mission.